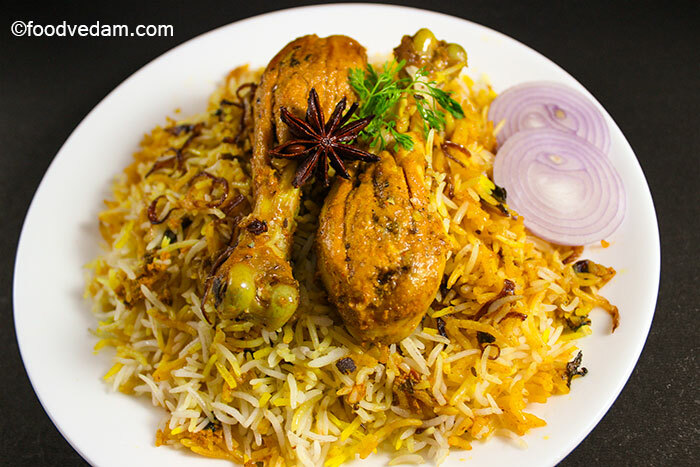 Hyderabadi Chicken Biryani Recipe with step by step instructions.Telugu Version. 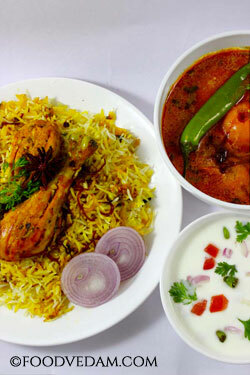 Hyderabadi Chicken Biryani is a world-famous recipe. any person(Non-vegetarian) who visits Hyderabad could not leave without eating Hyderabadi chicken biryani or Mutton biryani.there might be many places across India or all over the world where you can get Hyderabadi Biryani.But I strongly believe that it won’t taste like authentic Hyderabadi biryani.If you want to taste an Authentic one, you must taste it in Hyderabad itself.It is usually served with Mirchi Ka Salan and Raitha followed by a very tasty dessert Khubani ka Meetha. It’s my favorite, favorite and favorite recipe.in fact, it’s everyone’s favorite.I prepare it on every alternate weekend.when I feel lazy to get into the kitchen, we go to the nearby hotel and have it.Hyderabad House, Paradise, Cafe Bahar, Bawarchi are some hotels where we get an authentic Hyderabadi Biryani.I like Cafe Bahar Biryani very much.Paradise Biryani is made with ghee.they also add the few peanuts powder to the marinade.I saw it on the video playing at the parcel counter.few hotels add dalda or vanaspati to the Biryani to reduce the costs.I hate it really.my daughter won’t even touch the Biryani. The real taste of the dish depends on the way we prepare the chicken marinade and the spices we use.this recipe has many ingredients.but don’t panic.It is not as difficult as it seems.the logic behind this recipe is Patience + Practise = Perfection.Don’t expect the perfect outcome in the first attempt.but, once you achieve the art of cooking biryani it would be much easier than any other recipe. green chili paste, yogurt, and ginger garlic paste are natural meat tenderizers.so to make the meat tender, you need a proper soaking time for the marinade.1 to 2 hours of soaking is good for the perfect outcome.adding 2 tablespoons of ghee or clarified butter while mixing the marinade makes the dish even tastier. ఈ recipe తెలుగు వెర్షన్ కొరకు ఇక్కడ క్లిక్ చేయండి. Authentic Hyderabadi Style Chicken Biryani recipe. soak rice for half an hour.rinse for 2 to 3 times before cooking. put cinnamon sticks, cloves, cardamoms, shahi jeera, nutmeg, anise star, biryani ka phool or black stone flower, Marathi moggu, mace or Japatri in a blender and grind them into a coarse powder and keep aside. use 1 1/2 to 2 tsp of Biryani Masala powder for 750 grams of chicken. cut the onions into very thin long slices.heat oil for deep fry. fry onions till they turn into golden brown color.they will become crispy soon after you take out from oil. rinse chicken thoroughly, add salt, turmeric powder, red chili powder, biryani masala, ginger garlic paste, green chili paste, chopped mint leaves, yogurt and lemon juice. crush fried onions with your fingers while adding. pour oil.you can use the oil that was used for frying the onions. let the marinade rest for 1 to 2 hours. rinse the soaked rice for 2 to 3 times. take a vessel, add enough water so the rice can move freely in the water. add salt until the water tastes salty. add whole spices, mint and bring the water to a boil. when the water starts to boil add the soaked rice. after adding soaked rice, water stops to boil.so bring it to a boil again and cook for 3 minutes. after 3 minutes turn off the flame and strain out the water immediately. take a thick bottomed vessel, grease it with oil. add the chicken marinade, 2 tbsp of ghee/clarified butter and spread it evenly. add rice and spread it over the marinade. cover it with clean damp cloth or aluminium foil and place lid over it. cook it for 12-15 minutes on high flame and 5 minutes on low flame. turn off the heat and let it rest for some time. if you cook rice for more than 3 minutes the rice will get cooked completely and it will become mushy when you add it to the marinade for further cooking. tastes good when served with Mirchi ka salan and raita. Was short of two ingredients … Didn’t have biryani kaa phool…and what’s Marathi moggu? Anyway. Marinated it overnight and family just loved it again. Your recipes are simply simple but extraordinarily awesome! Moreover the way you make it, with such simplicity makes me feel so confident to try out the dishes especially the biryanis! I have never thought I could cook a prawn briyani or any briyani for that matter!! It turned out as a dish from an expensive restaurant!! Felt so good, thanks and all credit goes to you! Excellent recipes Bindu… Tried prawn biriyani.. it came out amazing.. my husband loved it.. Thank you so much..
simply awsome recipes easy to follow and everyone loved it. Thank you dear for sharing such an delicious recipe. you are most welcome dear…. i traied at home . it came out wonderly.it was very testy my famly was served it and they loved it verymuch… thank you bindu.